A thorough understanding of the spatial distribution pertaining to the histo-anatomic coronal structures and dynamic light interaction of the natural dentition provides the dental team with the ultimate strategic advantage with regards to optical integration of the final restoration. The second part of this two-part article will attempt to provide insight on the illumination interactivity and the spatial arrangement of the coronal elements of natural teeth through the utilization of this knowledge in the clinical and technical restorative approach. The main goals for this article are to cognize histo-anatomic visualization by introducing: (1) Dynamic light interaction, (2) the 9 elements of visual synthesis, (3) dynamic infinite optical thickness, and (4) amplified visual perception effect of the hard dental tissues. Furthermore, a diversification of photographic illumination techniques will be illustrated in order to juxtapose optical associations between the enamel/dentinoenamel complex/dentin nexus. Thanks to sophisticated adhesive techniques in contemporary dentistry, and the development of composite and ceramic materials, it is possible to reproduce a biomimetic match between substitution materials and natural teeth substrates. Biomimetics or bio-emulation allows for the association of two fundamental parameters at the heart of current therapeutic treatments: tissue preservation and adhesion. This contemporary concept makes the retention of the integrity of the maximum amount of dental tissue possible, while offering exceptional clinical longevity, and maximum esthetic results. It permits the conservation of the biological, esthetic, biomechanical and functional properties of enamel and dentin. 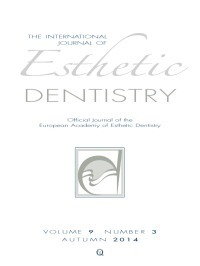 Today, it is clearly possible to develop preparations allowing for the conservation of the enamel and dentin in order to bond partial restorations in the anterior and posterior sectors therefore limiting, as Professor Urs Belser from Geneva indicates, "the replacement of previous deficient crowns and devitalized teeth whose conservation are justified but whose residual structural state are insufficient for reliable bonding. "1 This article not only addresses ceramic adhesive restoration in the anterior area, the ambassadors of biomimetic dentistry, but also highlights the possibility of occasionally integrating one or two restorations at the heart of the smile as a complement to extensive rehabilitations that require more invasive treatment. Summary: Establishing a geometrical pattern of the anterior maxillary sector has been attempted for a long time. The Golden Proportion, Preston's Percentage, Golden Percentage, Recurring Esthetic Dental (RED) Proportion and, most recently, Gauge Proportion, are theories that try to apply mathematical and geometrical relations to the anterior maxillary teeth. Purpose: To study the anterior maxillary teeth proportions of a Portuguese population sample and see if any of the existent anthropometric proportions can be applied to the oral rehabilitation of this population. Materials and methods: Standardized frontal and lateral images of 50 dental patient smiles included in the inclusion criteria were captured. The widths and heights of maxillary anterior teeth were measured using image-processing software and data were statistically analyzed using a parametric test (t test). Results: The widths and heights were concordant with the values described by the Gauge Proportion. However, they were above the recommended value of 78% for the width/height proportion advocated. The proportions between the widths of the maxillary anterior teeth were not constant as proposed by the Golden Proportion and the RED Proportion. The Preston Proportion was found to be in concordance with the studied population. The values observed were closer to the Golden Percentage. Considering genre, there was a statistically significant difference. Male patients had teeth with larger dimensions than females. Conclusion: Within the limitations of this study, mainly concerned to the sample size, it may be concluded that the widths and heights of the anterior maxillary teeth were coincident with the Gauge Proportion. Both the Golden Proportion and the RED proportion are unsuitable methods to relate the widths of the maxillary anterior teeth unlike the Preston's Proportion. The Golden Percentage was close to the percentages observed and could be adjusted to be taken in consideration to this population. Objectives: To evaluate the influence of thickness on the optical properties of two enamel shade composites, one with a high refractive index and one traditional. Methods: A medium value enamel shade was selected from the resin composites Enamel Plus HRi (UE2) and Enamel Plus HFO (GE2). Enamel Plus HRi is a high refractive index composite. Samples were fabricated in five different thicknesses: 0.3, 0.5, 1, 1.5 and 2 mm. Three specimens per material and thickness were fabricated. Three measurements per sample, over white, black and dentin composite background were generated with a spectrophotometer (Spectroshade Micro, MHT). Value, chroma, translucency and color differences (ΔE) of the specimens were calculated. Results were analyzed by the Pearson correlation test, ANOVA and a post-hoc Tukey test. Results: Increasing the thickness of the enamel layers decreased the translucency and the chroma of the substrate for both materials tested. For HRi the increase of the thickness resulted in an increase of the value, whereas for HFO it resulted in a reduction of the value. The two composites showed a significant difference in value for each thickness, but not in translucency and chroma. Color difference between them was perceptible in layers equal or higher than 0.5 mm. Conclusions: The high refractive index enamel (HRi) composite exhibits different optical behavior compared to the traditional one (HFO). HRi enamel composite behaves more like natural enamel as by increasing the thickness of the enamel layer, the value also increases. When planning a prosthetic rehabilitation of a periodontally compromised case, the clinician is often confronted with difficulties and dilemmas related to selecting the appropriate treatment modality that would provide a long-term longevity in terms of function and esthetics. In such cases, a correct diagnosis and prognosis of the intraoral situation supported by evidence-based dentistry is the basis for the establishment of a proper treatment strategy. In this two-part treatment planning series, a systematic approach of patient examination and prognosis of each tooth is presented. Furthermore, different removable and fixed treatment possibilities are described and the rationale governing the decision-making process is revealed. The execution of the final treatment plan as specified by the concept of comprehensive dental care is outlined and the final outcome is discussed according to the literature. Introduction: All parts of the face, other than jaw relationships, should be considered in orthodontic treatment planning. The role of forehead and neck in facial esthetics is well known; however, the majority of conventional facial analysis methods have not considered them. Neck and forehead may confer mutual effects on equilibrium and on esthetics of other facial components, and may change the overall convexity/concavity view of the profile. Therefore, the aim of this study was to assess the effect of anteroposterior position of the forehead and neck on the esthetics of skeletal class I, II and III jaw relationships using profile silhouettes. Methods: Class II and III jaw relationships were constructed on the silhouette of a class I normal profile by altering the mandibular position. Retruded, normal and protruded positions were also applied for the forehead and neck. Three hundred Iranian laypeople (150 men, 150 women) scored the esthetics of profile silhouettes from 1 to 7. Half of the participants were told to consider the profiles as a man, and the other half were told to consider them as a woman. Data were analyzed using non-parametric methods. Results: Class I jaw relation was found to be the most beautiful profile followed by class II and III respectively. Esthetics of different positions of the neck and forehead were significantly different (P < 0.05). In subjects with a normal neck and forehead position, and those with a retruded neck, the best esthetic relationship was class I, and the worst was class III. For protruded foreheads, the best jaw relationship was class II for females and class I for males, and the worst was class III for both. In a retruded forehead position, the most preferred jaw relationship was class I, and the worst was class II. For profiles with a protruded neck, the best esthetics was found to be in class III jaw relationship, and the worst was in class II. There was a small difference in scoring for male and female profiles (P < 0.05); there were also small differences in scoring trends of men and women (P < 0.05). Conclusion: This study showed that the anteroposterior position of the forehead and neck affects the esthetics of jaw relationships in profile view. In laypeople's opinions, in a normal profile, the overall appearance is more important compared to the independent position of the neck and forehead; however, having jaw abnormalities, the neck plays an important independent role. The preferred jaw relation for profiles with each forehead or neck position was introduced. Purpose: Marginal fit is valued as one of the most important criteria for the clinical quality and success of all-ceramic crowns. The aim of this in vitro study was to investigate the marginal fit of Lava Zirconia crown-copings on chamfer and shoulder preparations. Methods: Two acrylic model teeth were selected to simulate the clinical preparations: one molar was prepared with a chamfer finish line (C) and one premolar was prepared with a rounded shoulder finish line (RS). Each resin model was duplicated 10 times using silicon-based impression material and poured in type IV dental stone for the fabrication of working dies. A total of 20 copings were divided into two groups (n = 10 for each finish line). Fifty measuring locations were chosen randomly along the margin on the dies and the gap width - vertical marginal discrepancy - was measured under a light microscope with a magnification of x100. Measurements were made without cementation. The mean marginal gap widths and standard deviations were calculated and a one-way analysis of variance (ANOVA) was performed for different types of preparations in order to detect differences (α = 0.05). Results: The mean marginal gap was 30 ± 3 μm for the C group and 28 ± 4 μm for the RS group. The one-way ANOVA showed no statistical significant difference between the two groups (P = 0.23). Conclusions: Within the limitations of this study, the marginal discrepancies were all within the clinical acceptable standard set at 120 μm. Chamfer and shoulder preparations did not show differences regarding the gap dimension. Clinical significance: Bur design is an easily selected parameter before natural tooth preparation. Both tested finish lines are able to help clinicians in obtaining acceptable marginal fit values for the investigated zirconia copings. Managing esthetic restoration in the presence of discolored teeth is a challenge for both the clinical team and clinician, whose aim is to use methods that are as minimally invasive as possible, and materials that allow the preservation of dental tissue. Should one wish to act on the discoloration of teeth that are to be restored, or on adjacent ones, it becomes essential to take action on dental tissues. This is done through bleaching and dental restoration, using materials that allow various clinical situations to be managed, such as those with different tonalities between the teeth: prosthetic materials that offer adequate uniformity in their results in those areas where it is necessary to mask the discoloration. The use of technology such as bleaching, and ceramic materials simultaneously can achieve excellent cosmetic results. This article explains how to integrate bleaching compared to prosthetic treatment, in terms of time, in the various cases of discoloration, and what factors to consider when choosing the timing.